Every year, on the Tuesday before Ash Wednesday, the start of Lent, people of all denominations celebrate a holiday of fantasy and whimsy. With faces covered in masks ranging from heavily ornate to mysteriously simple, bodies outfitted in outrageous costumes ranging from scandalous to hilarious, people take to the streets to revel in what traditionally was the last glorious day of excess and joy before the 40 days of mourning prescribed by the Christian Church. However, even as fewer people participate in Lent every year, the Mardi Gras practices of eating lavishly, imbibing copiously, and generally being merry in any and all manners continue across the world — in many places well past the singular date of Mardi Gras. While Quebec City may be the Canadian town most notorious for Fat Tuesday festivities, the French Canadians have nothing on Niagara Falls. Though the annual celebration occurred on February 17, Niagara Falls is dedicated to continuing the party well into spring. Here are all of Niagara’s hot spots where you and your friends can enjoy in the dazzling Mardi Gras style throughout the season. Even though Niagara Falls is frequently called “The Honeymoon Capital of the World,” the city is as well-known for starting love affairs as it is solidifying them, and there is no better place to meet new people than in a crowded club filled with music and dancing. Niagara Falls boasts some of the best destination bars and clubs in the country, which means you and your friends will have no shortage of late nights to make merry during Mardi Gras. One club in particular takes the familiar and exciting atmosphere of Mardi Gras to the extreme: Instead of carousing for just the season, Club Mardi Gras welcomes Fat Tuesday pleasure seekers all year-round. Inspired by the wild and free celebrations of New Orleans, Club Mardi Gras provides partiers masks and beads with the hope of encouraging fanciful fun. Bright lights, loud music, and elevated dancing cages ensure a thrilling night; as goes the slogan of Club Mardi Gras: What happens behind the mask stays behind the mask. Rumours Nightclub. Dedicated to hot beats and cold drinks, Rumours knows how to get a party going. The club cultivates only Niagara’s best DJs, and the regular crowd is always rowdy — in a good way for Mardi Gras celebrations. Club Rouge. Rouge is the newest club to hit Niagara’s scene, but it opened with a bang and hasn’t stopped running since. Effectively balancing elegance and high spirits, this club is an excellent choice for both a kickoff point and a last stop on your night of merrymaking. Club Se7en. Long touted as the crown jewel of Niagara’s night scene, Se7en is as sophisticated as it is boisterous — the perfect atmosphere for Mardi Gras. With a full bar and dancefloor ready all night long, you might never want to leave this club. 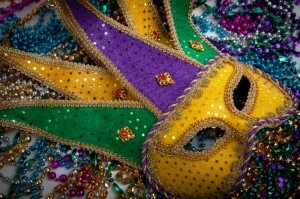 Even after all-night revelries at Niagara’s best bars and clubs, you can spend your days in the Mardi Gras spirit. You can enjoy a relaxing day full of winery tours replete with luscious tastings and mouthwatering food pairings; in fact, Reif Estate Winery welcomes Mardi Gras celebrations on March 7 with discounted prices and festivity-specific food. You may also choose to spend your days luxuriating in the pools at Fallsview Indoor Water Park or wandering around Niagara’s myriad beautiful parks and gardens. After all, you’ll need to conserve your energy for more nights of Mardi Gras magic at Niagara’s nightclubs.